It was just recently that we brought you images of the 2018 Jimny being tested for benchmarking but earlier than that we also showed you the images that were leaked online. But now, with this new pictures, we can say with certainty that there’s a lot of progress that has gone into the production of the Jimny. 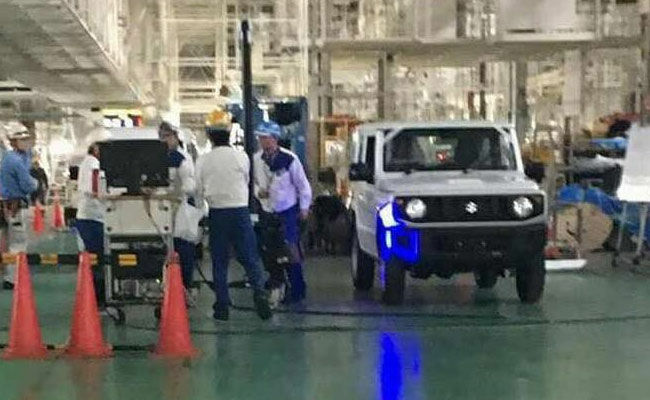 Images shared from a Twitter handle called Hunfooli shows the 2018 Jimny sans any camouflage and inside the factory. Of course, from what we can see, the Jimny is probably undergoing trial production and while we expected it to be showcased at the Tokyo Motor Show, Suzuki reserved the debut for another day. The Suzuki Jimny flaunts its boxy design and old-school looks. Those have been its signature qualities and it seems like the new Suzuki Jimny will also have them in abundance. In fact, the new Suzuki Jimny is boxier than ever and the new design makes it look even better by making it look more sophisticated. The five-slat grille and the circular headlamps make it look like a mini G-Class and that’s where the ‘sophistication’ part comes in. The new Jimny also comes with a more muscular bumper with round foglamps, a clamshell-style bonnet. The Jimny continues to be a two-door model with flared wheel arches and side skirts and twin-5-spoke black alloy wheels, boxy ORVMs. The rear comes with a tailgate-mounted the spare wheel and different colored-lights on the rear bumper. The cabin is not visible in these images but based on the leaked photos from last time we can tell you that the interior will also be all-new. The new dashboard design will come with a modern classic look with large control dials and knobs, a touch screen infotainment system, large two-pot instrument cluster and more. The SUV will also come equipped with Suzuki’s Allgrip Pro 4×4 system for improved capabilities. On the other hand, engine options are likely to include the 1-liter BoosterJet turbocharged petrol, as well as the 1.2-litre petrol options. India will definitely be on the radar for the Jimny, considering how well the country is responding to SUVs and compact ones at that. We wait to hear what Maruti Suzuki has to say about its launch but we can’t wait to know when it’ll make its way here.